Dogs bodies are very forgiving and very adaptable to diet inadequacies, but just because they can survive on an omnivorous or sub par diet does not mean it is the correct diet style for them. 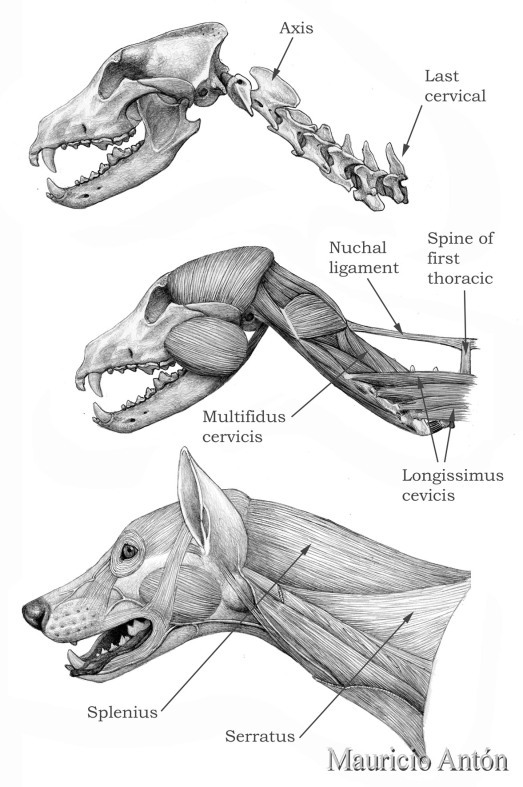 There is an assumption that dogs are natural omnivores but if we look at the dogs biology it is obvious they are carnivores (or scavenger carnivores). Have you ever played tug-of-war with your dog? Have you ever wondered how the heck can they pull so hard with just their teeth? It’s because dogs (and cats) have powerful jaw and neck muscles that help with taking down their prey and ripping and chewing the meat and bone. Their heads are shaped to prevent side to side movement of their bottom jaw, it can only move up and down like scissors and the teeth actually rest next to each other (like closed scissors) when the mouth is closed. The molars of herbivores and omnivores lay flat on top of each other so they can grind plants with side to side motion. If you look at you dogs (or cats) mouth you can see that they have large sharp teeth, they do not have wide flat molars that would be evidence of a herbivore. Their large “canines” and sharp back teeth are used for ripping, gnawing, cutting and tearing meat and their molars are pointed and aligned to act like scissors for cutting and slicing the meat and bone. If we look at our own teeth (or the teeth of a cow or horse) you will find wide flat molars so we can grind and smash fruits and vegetables. Since dogs and cats don’t have these flat molars it makes sense that they are not designed to eat veggies, they did not evolve that way. Dogs (and cats) have a short intestinal tract meaning they lack the ability to ferment plant matter for digestion, this is only achieved in longer intestinal tracts. They also have a fairly flexible stomach which allows for large quantities of meat, bone and organs to be eaten at once (think prey). This means that the food they eat does not stay in their system for a very long time and it passes through quickly. Vegetation requires time to ferment and is indicative to herbivores or omnivores who have the longer intestinal tract. Carnivorous animals such as cats and dogs do not produce the digestive enzyme amylase in their saliva to start breaking down carbohydrates and starches. This places a lot of stress on their pancreas making it work harder to digest carbohydrate rich foods. Dogs also do not have the necessary gut bacteria to break down starch so the nutrients in plants are unavailable for them to utilize. This is why we have been instructed to thoroughly cook all carbohydrates before feeding them to your dog. So when pet food manufactures use plant carbs in their foods, knowing that dogs (or cats) cannot obtain the nutrients from plant sources, they overcompensate by adding very large amounts of synthetic vitamins and minerals to their foods. The evolutionary design and anatomy of our pets leads to our pets being carnivores. They have evolved to take down prey with lean bodies that are adapted to quick bursts of energy. Their jaw has strong muscles to rip, tear and gnaw. The shortened gastrointestinal tract allows for quick digestion of animal fats and proteins and lacks digestive enzymes and gut bacteria to digest carbohydrates. All of these facts makes it quite clear that our dogs (and cats) are carnivores not omnivores. And as pet parents we need to make the best choices we can for their health and longevity. Please feel free to leave me a comment or question below, I try to answer all comments within 24 hours. hello there .I really enjoyed your article. I have a chocolate labrador my self and I really adore him. So finally if they are a carnivore, what is best to feed them? Do you think meat? Do you think raw meat is bad for the dog? I really liked your website! It was very knowledgeable! I too am from a farm and my family has lots of animals around. Since my website is about cooking, I didn’t even want to make animal food, but I liked the tips and I Like the pictures! Thank You so much for visiting my website, I’m glad you liked it. It sounds like you read a few of my posts, Thank you for that, Best wishes on your own website. Thank you for reading my post, I’m glad you found it helpful. I share with my dog too and I know I shouldn’t, but I do make sure to restrict the carbs and anything spicy or sweet. It’s hard to say no to them. This is the most interesting article I’ve read so far today. I’ve learned so much. I don’t have a pet myself, but my friends do. They always tell me how their dogs have problems digesting foods that humans eat. After reading your article, I learned that dog’s bodies aren’t designed to handle certain foods. I always wondered how dogs can pull so hard with just their teeth. There are bunch things I wondered about dogs. Your article answered all of my questions. Thank you so much for sharing. First off, thank you for reading my post. Isn’t that a fabulous picture of the jaw structure? Even though your dogs are little they need their meat. Kudos to you for recognizing their need. I feed my dog cooked brown rice with chicken meat and she seems to take it fine. She has been fed that for over 10 years and there seemed to be nothing wrong with her health. Our vet also told us that she is perfectly healthy even though the diet contained brown rice, which is a form of carbohydrates. Making your own dog food is a step in the right direction, good for you. My only concern is if you are feeding only chicken then your dog may not be getting all the essential nutrients she needs. I would encourage you to add some chicken gizzards and maybe some beef liver and a high quality vitamin topper. There are some great freeze dried toppers on the market that include the organ meat and bone that your dog requires. One very good brand is Vital Essentials, the flavor my dog (and cats) like the best is the Freeze Dried Turkey Toppers. I also read a research the other day that pointed out that dogs are carnivorous and that adding any other food to their diet does not help them in anyway. But why do they still love to eat normal foods and seem to enjoy them plus my dog loves avocados how does one ensure they are getting all the nutrients they require? Hello, thanks for reading my article and it is not easy to know what’s best for our dogs. It’s the same as having an infant or child in the house. We need to be aware of what is ok for our pets to consume and what is dangerous for them. Our pets will eat anything that tastes good to them just like humans do. Dogs are carnivores by nature but they are also opportunists, meaning if they CAN get it they WILL. I have to enforce the rules in my house that if anyone has chicken on the bones, chicken skewers or corndogs that the scraps be taken out of the house to the trash bin immediately, they are not allowed to be left in the kitchen garbage. The last thing I want is my dog to eat a skewer or corn dog stick and have it get lodged in his throat, he smells chicken, he does not realize that it’s a stick and not edible. This is a serious example but the fact remains that we have to arm ourselves with knowledge so we can feed our pets the best forms of nutrients that we can get our hands on. Dogs are amazing animals. I agree with you that dogs are carnivores, just like wolfs (they share many similarities). But I also think vegetables and fruits can benefit dogs (just like foxes, who share many similarities with dogs but eats plants and berries). So I guess it is best to give a balanced diet but focused on proteins and fatty acids. Thank you for sharing this helpful information! I learned a lot, particularly the anatomy. Great read! 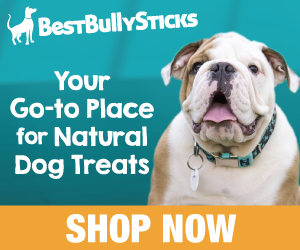 Thank you for reading my post, you are correct in that dogs can have some berries of vegetables, I have a great article about natural dog treats, you can read it here. The bulk of a dogs diet should be muscle meat and organ meat with a little bone and fruit or veggies as treats, that’s why the Vital Essentials, Northwest Naturals or Primal Raw Nuggets are great choices because they already have the correct balance of bone and organ in them. We are dog lovers so I really enjoyed this article for many reasons. You bring to our attention what is best to feed dogs and, more importantly, why. I did not know they can’t breakdown the carbohydrates like humans. 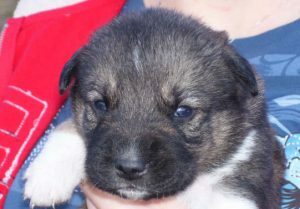 Do you recommend a certain dog food company to make sure our dog is fed properly from birth through old age? Thank you for reading my article. If you can afford to feed a freeze dried food such as Vital Essentials or Primal Raw, I would recommend that over a dry kibble but Nutrisca is a decent brand but they do use chickpeas as a carb source so check with your vet to be sure that’s ok for your dog, I did feed it for several years and did not have any problems with it and I do believe they are still recall free. Most all of the commercial pet foods have had recalls over the years for one reason or another. That’s one of the main reasons why I decided to make my own dogfood. There are several high end brands that have your pets best interests at heart, do a bit of research and pick one you are comfortable with. It’s a relief to see that they are indeed carnivores and not omnivores! My dogs eat quite a bit of meat and they love it. A question I have for you is: is it bad for my dogs to eat raw meat? I quite often give them pieces of chicken etc when I’m cooking and do occasionally think whether it’s a good idea or not. Thank you for reading my article, it is ok to give your dog raw meat, that’s what’s natural for them. I would advise you to check with your own veterinarian to get their professional opinion, they are familiar with your dogs health and would be able to give you personalized guidance. I switched my previous dog (purebred GSD) to grain free kibble when he was itching all the time. Never had a problem after that. Nowadays I supplement with raw meat. There HAVE been times, though, when I have intentionally fed my dog green beans and/or pumpkin. When I want to take the weight off! When I reduced the amount of food that I fed my previous dog in order to take 10 pounds off, he started eating compost out of the garden. He thought he was starving! So I added pumpkin which filled his belly, but like you say, went right through. Then I gradually eliminated the pumpkin. My holistic vet friend doesn’t feed raw because she doesn’t trust the American food sources. She combines meat, cruciferous vegetables, and other vegetables in a crock pot on low for hours. She also supplements with Calcium and a good vitamin supplement. Sure are a lot of options out there. Good thought-provoking article! Sounds like you have a close personal informant for your dogs diet, I personally feed a slow cooked homemade food for the same reasons, my dog prefers the cooked food also. There are tons of options out there, we just need to feed as close to nature as possible.